SFC Based minific. Young Cobalt is initiated. The initiation of Cobalt was quick and surprisingly easy. Starscream, the father of the Seeklet, held the tiny child in his hand and approached Megatron with a scared glint in his optics. It was no secret that Megatron hated Starscream for taking his adopted human daughter as his wife-unit and Starscream, who had not even told Megatron of the conception of Cobalt, knew that this event could go two ways. One, things could be fine, or two, he could end up as recycled tin cans. Starscream stood before Megatron. His wife-unit Rachel stood by his side, peering up at the two large bots, hoping all would go well. She had never witnessed a Cybertronian initiation before, so it was all so new and fascinating. 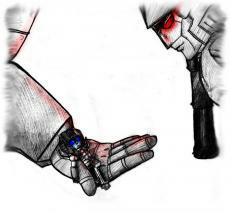 A small, metallic cry was heard from inside Starscream's cupped hand. Cobalt was restless. This made Megatron peer down at Starscream's closed hand with curiosity. "A good vocal processor on him." His face was still stern at he glared at Starscream dead in the optics. "Good. Good." It was then that the initiation began. With his hand outstretched, Starscream opened his fingers to reveal the tiny Seeklet inside. Megatron's face instantly and surprisingly softened into a smile as he stared at the child, his optics flashing in recognition, as Cobalt's own bright blue ones stared back at his. "I have witnessed the child, Starscream. I, Megatron, accept it's existence and initiate it willingly. Do you, witnesses of this initiation, accept this and truthfully swear that you have witnessed this?" "We swear." Optimus, Thundercracker and Ratchet raised their hands and brought them down to their chests in a salute. Megatron reached out a hand and took the child from his father. Starscream cringed a little. He still wasn't sure if Megatron had a hidden agenda. It seemed all too nice as Energon pie for his liking. "I, Megatron, guardian of this child, hereby announce to all that Cobalt, firstborn son of Starscream, is one of us!" "Till all are one!" The witnesses stood up and raised their arms in a salute once again, before crowding round the small Seeklet in Megatron's hand, staring at it with loving curiosity. The initiation over, Megatron handed Cobalt back to Starscream, who snatched him quickly and held him close, causing Rachel to pat his leg to reassure him. Megatron turned on his heels and walked towards the other side of the room. "Megatron, wait!" Starscream called out, flailing his other hand towords him to get him to halt. "I don't get you." The wing commander frowned, his free hand now perching on his hips. "Why the sudden change? I would have thought you'd have been eager to squash Cobalt, what with the history and all." Megatron let out a chuckle and turned round. "Any child of you, Starscream, is a minion for me. I wouldn't DREAM of squashing valuable resources. What do you take me for?" With that said, he walked out the room laughing along the way. "Pfft," sighed Starscream looking down at his wife-unit. "I knew it was too good to be true." © Copyright 2019 Melty Cat. All rights reserved. Does this count as Masturbaiting? The Truth Behind The Story Of Red Riding Hood!